Located at the Inn’s Le Chateau property, this third-floor room features two gabled windows, perfect for gazing at Lake Superior or curling up with a novel. Even the deluxe private bath, featuring “His and Her” sinks and a spacious modern shower, has a view of the Fountain Garden below. The fireplace is visible from the plush, queen bed as well as the seating area and double-seating whirlpool tub. Fireplaces are operational from mid-October thru April. Air conditioning adds to your comfort during the summer months. 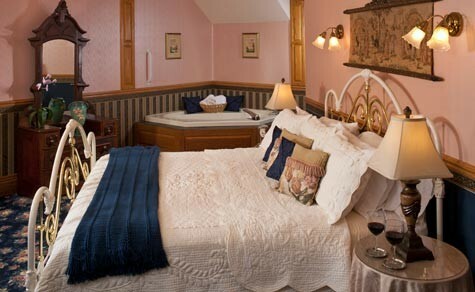 Join us in our Bayfield, WI bed and breakfast for a getaway to remember. You really don't feel like you're a guest. You feel like a part of the Rittenhouse family.